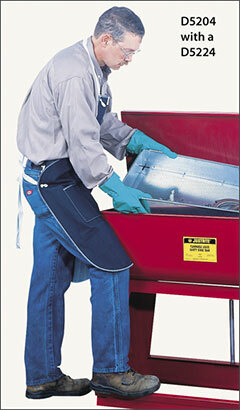 Dip tanks, parts baskets, rinse tanks, floor standing tanks, Justrite bench top rinse tanks, and sediment screens. 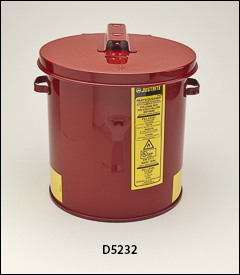 Additional flammables containers are shown on our Safety cans page. Constructed of heavy gauge terne plate. Useful if work doesn’t require larger tank. Manually operated covers stay open for convenient access. Covers are equipped with a fusible link which melts at 165°F and slams the cover shut in case of a fire. Baskets available for all but 1 gal size. FM and UL approved. Capacity listed below is for the tank without a basket. WARNING: Proposition 65 Label for dip tanks . 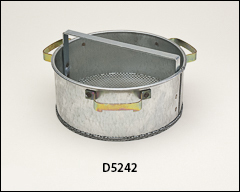 for the above dip tanks are two-handled, round parts baskets. Useful for cleaning many small parts in a single operation. Lugs in dip tank hold the basket above liquid level for fast draining of parts after immersion. Large capacity rinse tanks in bench top or floor standing styles. Heavy terne plate construction. 3/4" drain plug. Sediment screen or parts basket optional. WARNING: Proposition 65 Label for rinse tanks . Floor standing tanks include a self closing cover operated by a foot-treadle so it can be opened when both hands are full. Adjustable pneumatic check prevents cover from slamming shut when treadle is released. 33 1/4" off floor. are the same size as the floor standing tanks but they feature a lift-and-latch style cover. are optional for either style rinse tanks.